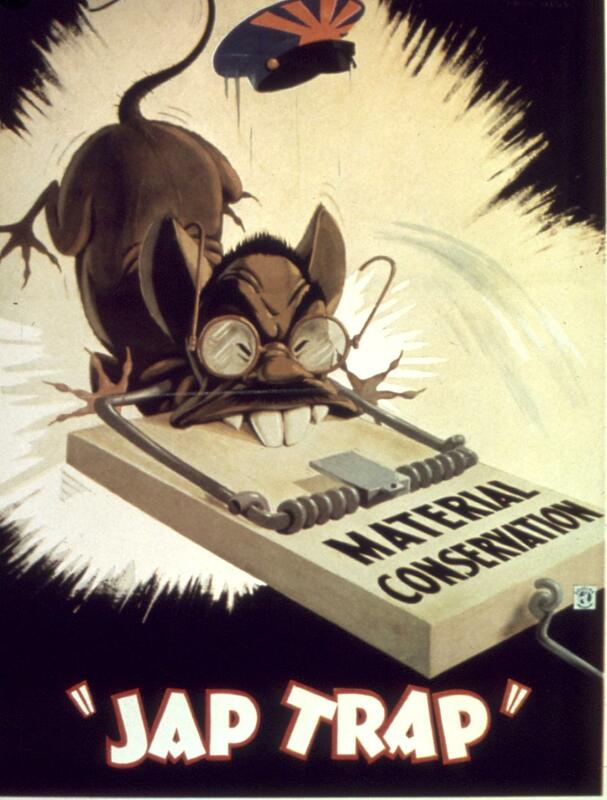 World War II era United States propaganda poster by the United States War Department, circa 1941-45. How does it feel to wear the face of the enemy? A look at social forces and attitudes in Hawai'i around the time of WWII. Ted T. Tsukiyama (1920-) of Honolulu, Hawaii, was a member of first the Varsity Victory Volunteers, then the 442nd Regimental Combat Team’s 522nd Field Artillery Battalion during World War II. Not long after he joined the 442nd he was transferred to the Military Intelligence Service and served in Burma. 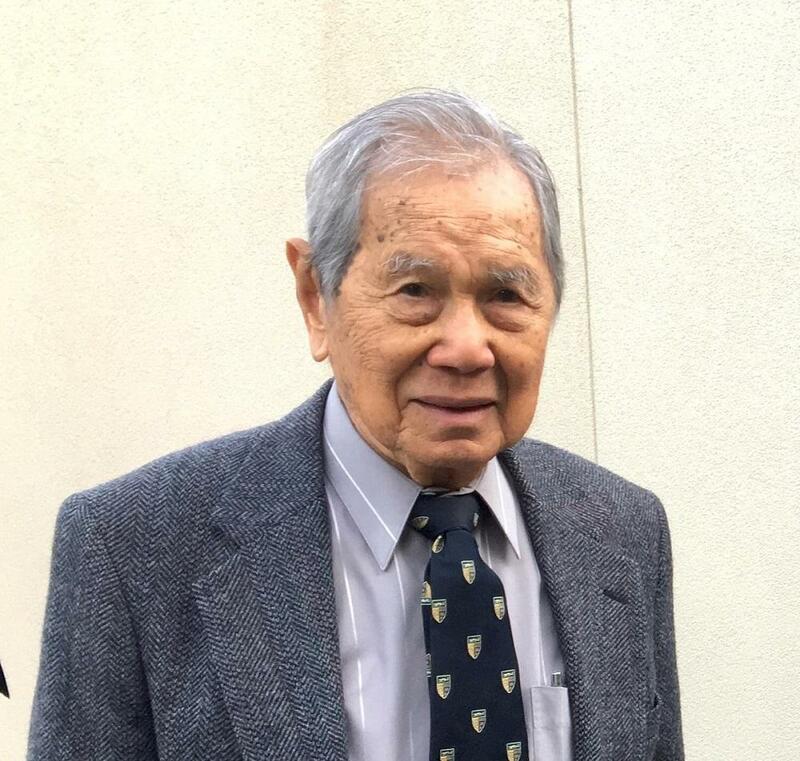 Ted Tsukiyama, now 96, was at home in Kaimukī recovering from his University of Hawai‘i Junior Prom when the attack happened. “When I saw the Japanese planes, I was swearing at them, Damn fools! What are you doing attacking America? We had no question as to who we were and where we stood, but we knew there were a lot of other people that didn’t, and had suspicions, and of course, even the racial tensions and even hatred became pronounced with some of the haoles (foreigners, Caucasians)." Honolulu in in December 1941, Christmas lights festooned all of Fort street, past Chong’s Silk House, the Ritz and the Blaisdell Hotel. Tsukiyama says life was laid back. Was there racial tension? “After Pearl Harbor, yeah,” But before? “No, I don’t think so.” But If there was no racial tension, it was not because races lived on equal terms. 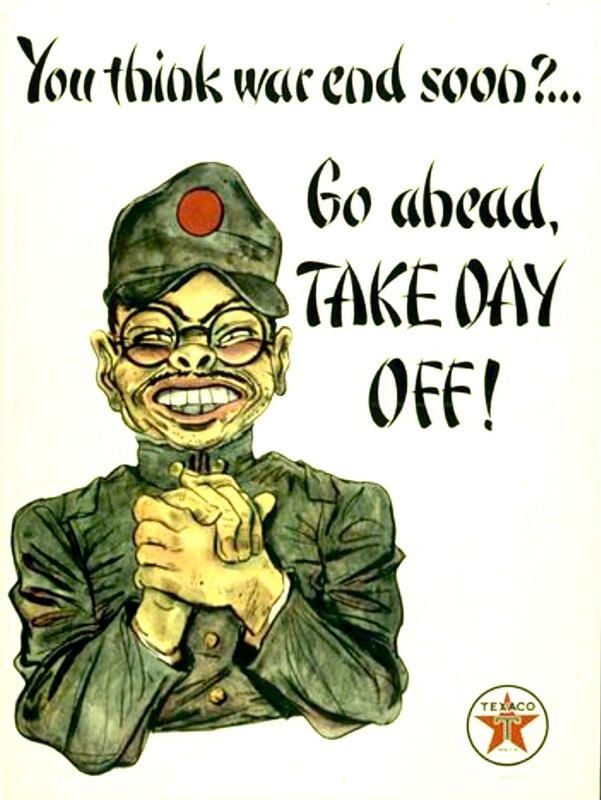 Racial stereotyping drove messages of all kinds, like this one against absenteeism. 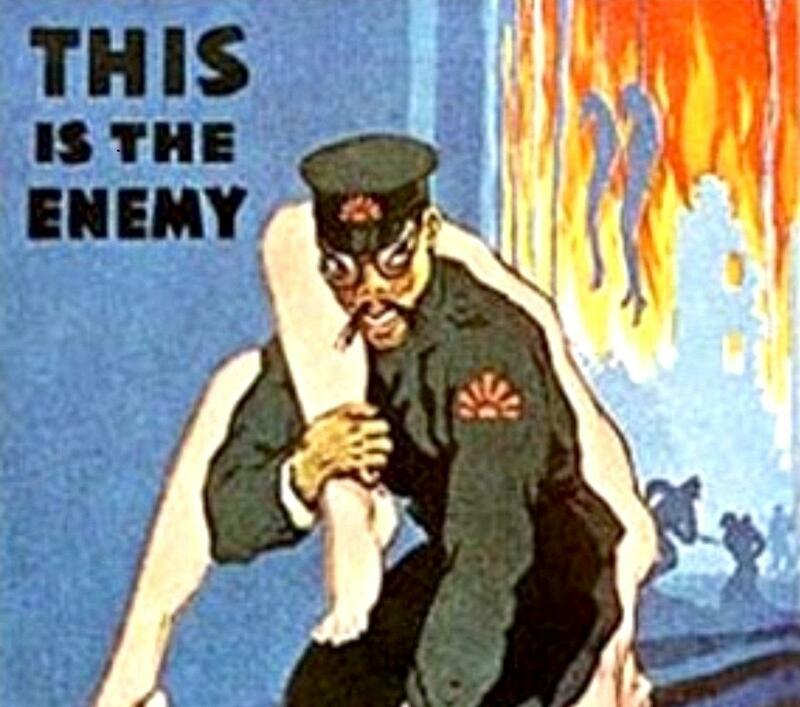 During WWII, stereotyping proliferated in the private sector and in U.S. government media. Everybody just kind of accepted that? 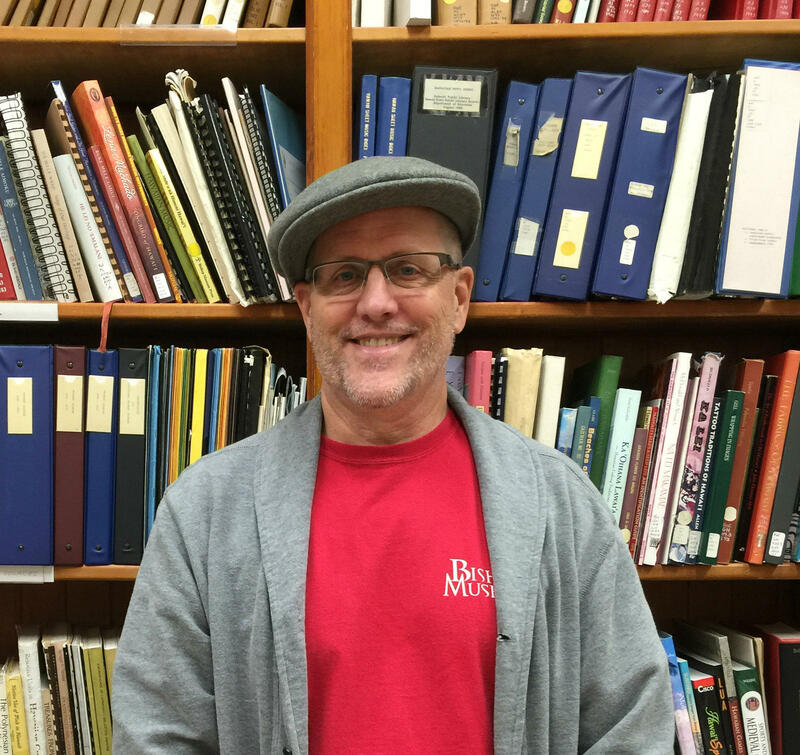 Jonathan Okamura, UH Mānoa Professor of Ethnic Studies, says while some Japanese in Hawai‘i banded together or pressed legal cases for equal rights and protection, most Japanese were afraid to challenge the establishment. Fred Makino, head of the Hawai‘i Hochi newspaper, organized and assisted legal and labor efforts to secure rights for Japanese. Reverend Takei Okamura of Makiki Christian Church and Yasutara Soga, head of the Nippu Jiji newspaper had discouraged the sugar strikers, and urged acceptance of Japanese Language School restrictions. Okamura says most local Japanese did not want to challenge the power structure, they simply hoped to move up in it. Honolulu was heavily influenced by Japanese culture. In 1941, thirty seven percent of the population was ethnically Japanese, largely working as laborers, shopkeepers, tradesmen, or domestic workers. All ethnic Japanese, nationals, U.S. citizens, 442 Battalion members and all, appear to be lumped together in images like these. Since incarcerating over a third of Hawai‘i’s population was unworkable, martial law was imposed to regulate all residents, says Bishop Museum historian Desoto Brown, and patriotic Americans here went along with it . At first, they feared a Japanese invasion. Bishop Museum historian Desoto Brown has curated a small exhibition of select photographs and memorabilia from the WWII period, "Homefront Hawaii," in Portico Hall in the Hawaiian Hall Complex through March 1, 2017. Brown has also authored a book of photographs with commentary about the period, "Hawaii Goes to War." 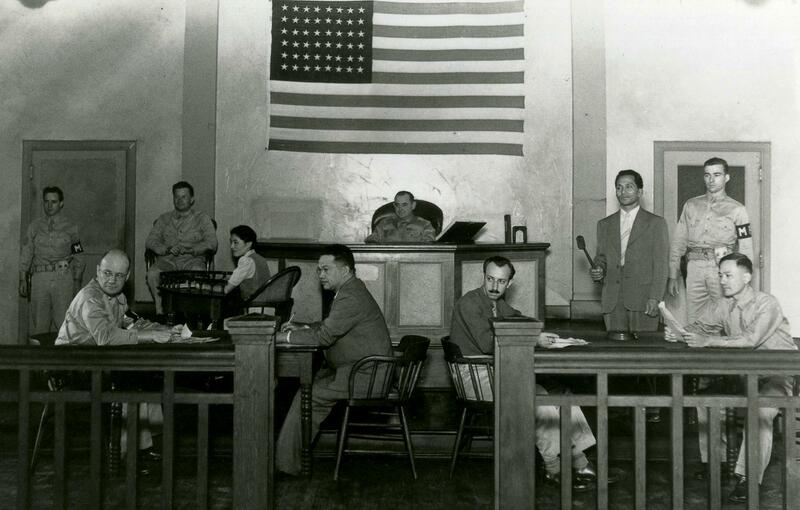 Under martial law in Hawaii, civilians were subjected to courts like this, without lawyers and under the jurisdiction of military officers serving as judges. The US Federal Supreme Court ruled in 1946 that such treatment had been unconstitutional. Mahalo to Desoto Brown for sourcing this material. Food and fuel were rationed, there were curfew and black out restrictions, and under martial law, there were no civilian legal proceedings. Legal protests to prolonged martial law mounted, and though it was officially lifted in 1944, the military maintained a grip. World War II was a defining point for Hawai'i, and the experience of Japanese Americans through the war has increasing relevance today. We'll take a look at related contemporary issues next. 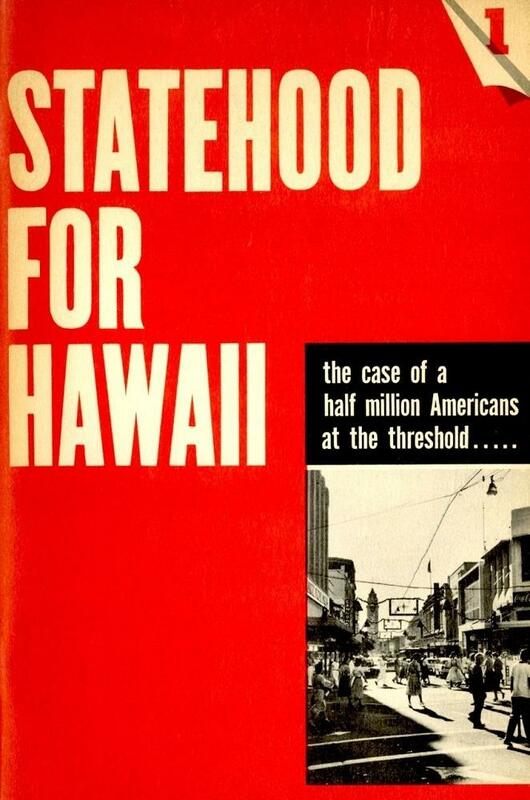 The cover of "Statehood for Hawaii", a 1958 booklet published by the Hawaii Statehood Commission. Publicity advocating statehood was widespread throughout the USA during the 1950s, and finally occurred in 1959. The "second-class" status of living in the Territory of Hawaii was a source of resentment for Hawaii residents. According to historian Desoto Brown, resistance to statehood in the US legislature was partly based on racism against a predominately non-white population. Japanese school students were among the civilians killed on December 7, 1941.